Yes, I'm still using my last few scraps from the retired Simply Scrappin' Kit, Crew Kids Girl. Those of you who have followed my blog posts over the past year, know how obsessed I've been over the designer paper in this kit. Even though it's retired, I'm still using it! 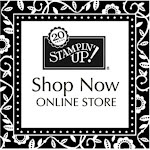 Amazing how many cards you can make from one of Stampin' Up! 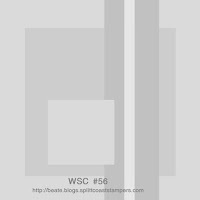 's Simply Scrappin' Kits! 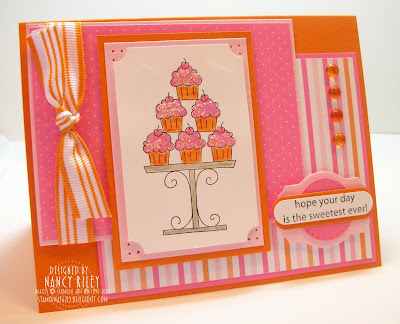 The layout for this card is from SCS Sketch Challenge #194, along with the new stamp set, Crazy for Cupcakes. 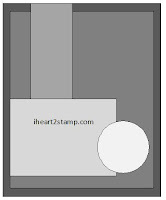 * The bottom 1-d panel is a self-adhesive die-cut from the Crew Kids Girl Simply Scrappin' Kit. * There is paper piercing around the perimeter of the card. * Diamond Stickles (non-SU) were applied to the cupcake frosting. 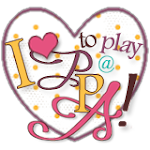 *The paper piercing on the 3/4" and 1" circles behind the sentiment were created using the Punches Plus Classy Brass Template. I haven't posted or stamped ALL week! I'll consider this my warm-up card .. amazing how it takes a few tries to get the mojo back! I'm hoping to get a few more cards designed today before heading back to work tomorrow. 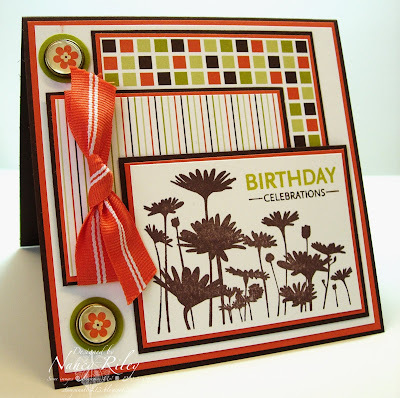 This card uses Jen del Muro's Sketch For You To Try 09/20/08. I used the stamp set, Batty For You with Ghostly Greetings Designer Paper. The stitching is from the retired stamp set, All In A Row. I've owned this stamp set for a very long time and this is the first time I've ever used it! 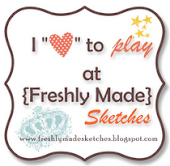 I found it quite intimidating but now that I've mastered my Stamp-a-ma-jig I may use it more often! I love the look of stitching in papercrafting and would love to have the patience to stitch with my actual sewing machine. 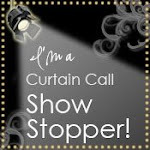 But, swear words tend to spill out of my mouth every time I try to use my sewing machine! LOL! I added paper piercing within the stripes of the YUM YUM dp and within the scallops of the scallop circle, three Pewter Jumbo Eyelets along the side, and Basic Black 1/4" Grosgrain Ribbon. Many of you have been so kind in asking how my new job is going! Just wanted to give you a quick update and let you know that I am feeling much more comfortable than I did those first couple of weeks. I am enjoying the students and fellow co-workers but do very much miss being home and staying on top of my household chores. 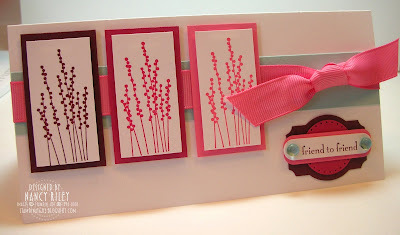 This card uses Jen del Muro's Sketch For You To Try 09/13/08. 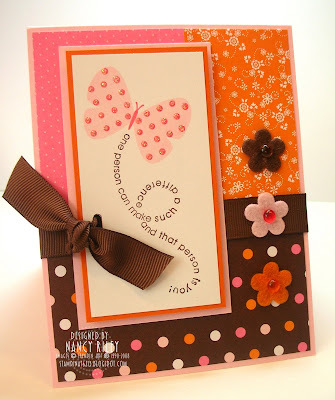 Again, I used the stamp set Flight of the Butterfly but this time paired it with Sweet Always DP. I used the Stamp-a-ma-jig to line up the words and two butterfly images on top of each other, and found the Stamp-a-ma-jig to be a necessity with this stamp set. 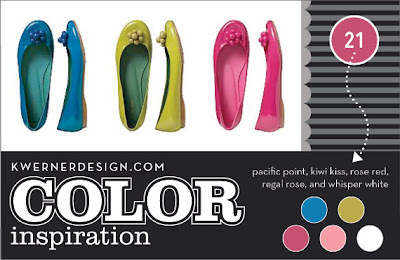 The words were stamped in Chocolate Chip, and the butterfly in Pink Pirouette with the dots on the butterfly stamped in Regal Rose. Diamond Stickles (non-SU) were added to the dots on the butterfly. The Chocolate Chip 5/8" Grosgrain Ribbon is threaded through a hole in the main image panels made with the Horizontal Slot Punch (one layer at a time!). The Flower Fusion and Flower Fusion Too, along with the coordinating Dew Drops (non-SU) were adhered using Tombo Adhesive. I stayed home from work today with a nasty sore throat and and stuffy head. I sure hope I'm up for returning to work tomorrow, as I'm not thrilled about starting to use those sick days this early in the school year! I made this card last night using Kristina Werner's Color Inspiration Challenge #22 ... Bravo Burgundy, Rose Red, Regal Rose, Soft Sky, and Whisper White. I'm honestly not saying this to receive "sympathy comments", but I don't think I like this card. 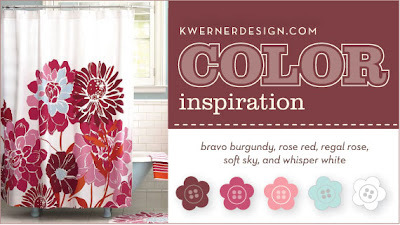 This color challenge was just that - a challenge! Also, I promise that I won't use that layered sentiment medallion again for quite awhile ... I've been using it way too much lately! 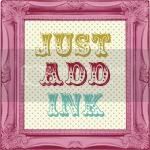 I DO like the new stamp set I used - Pocket Silhouettes. Looking forward to playing around with it some more! 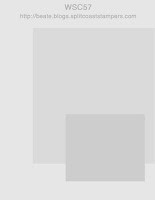 Note: Card measures 6 1/2" x 3 1/4". I received this very cute card from the very sweet and thoughtful Wendy Janson! Wendy's card uses the new stamp set, A Flower for All Seasons (pg. 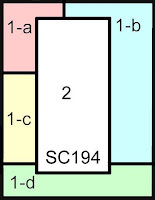 87 US). 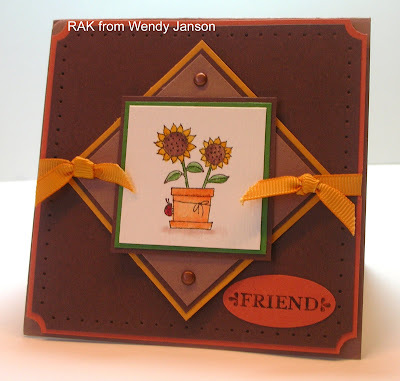 Visit Wendy's blog, It's All About Stamping! to see more incredible artwork from Wendy! First, my apologies for the poor lighting in my photos. I'm having to photograph at night - not my first choice for lighting conditions. ETA ... Original photo has been replaced with a new and improved version! I have been fiddling around with this card on and off for almost a week and finally decided to let it go so I could continue on with other projects. I started out using Julee Tilman's Mojo Monday Sketch #51 but ended up not using on e of the layers ... just couldn't get it to work. Remember this designer paper? Remember my obsession with it last winter? Yep, it's from the retired Winter Bright Simply Scrappin' Kit. I just HAD to try it with this cupcake image from Crazy for Cupcakes! 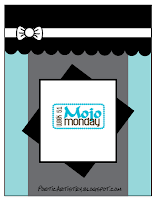 The cupcakes image is stamped in Basic Black and colored in with Pretty In Pink and Bashful Blue Markers. The icing is covered in Diamond Stickles and the cherries are colored in X-mas Red Stickles (non-SU). 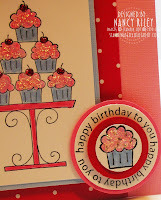 The sentiment medallion uses the "happy birthday to you" image from the Crazy for Cupcakes stamp set ... the image is curved making it very easy to create a circle. The cupcake in the medallion was created using the Cupcake Stampin' Around Wheel and colored the same as the other cupcake images. 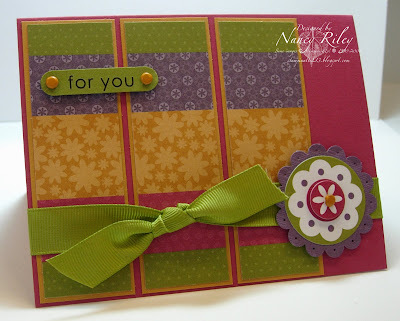 Today's Featured Stamper #83 on SCS is Denise, Card Crazy. HERE is Denise's beautiful gallery, and HERE is Denise's card I chose to case. 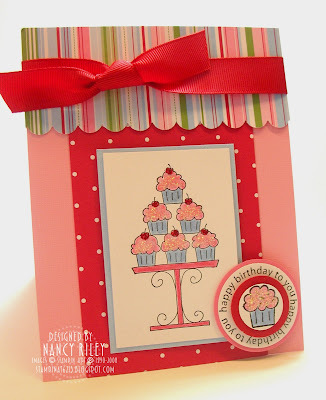 * My card uses the new stamp set Crazy for Cupcakes, and the new designer paper, Sweet Always. Colors ... Pumpkin Pie, Regal Rose, and Pink Pirouette. * The cupcakes were colored using Pumpkin Pie and Regal Rose Markers, then Diamond Stickles were added for sparkle and depth. The cake plate was colored using the Sahara Sand Maker. * The Ticket Corner Punch was used on the main image panel, then three holes were Paper Pierced on the Pink Pirouette panel. 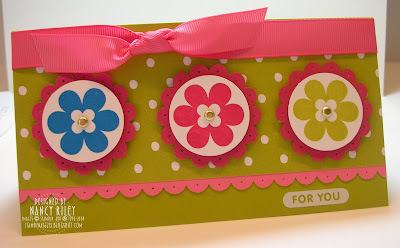 * The sentiment piece was created by punching Pink Pirouette CS with the Designer Label Punch, then Paper Piercing Regal Rose CS using the Punches Plus Classy Brass Template and punched with the 1" Circle Punch. Be sure to pierce first, then punch ... it's soooo much easier! The sentiment was stamped in Basic Black onto Whisper White CS and punched with the Word Window Punch. 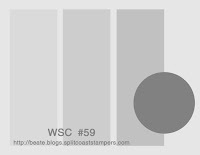 I then punched two Pumpkin Pie CS Word Window Punches and staggered them behind the Whisper White CS piece. 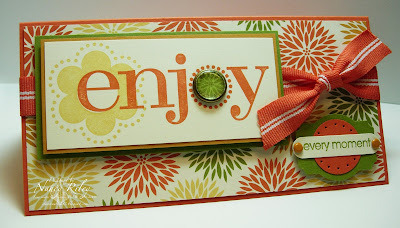 * I added the 1/2" Pumpkin Pie Striped Grosgrain Ribbon on the left to balance out my card. Don't know why Denise's card seemed balanced and mine didn't ??? * The orange Dew Drops are adhered using Tombo Adhesive. 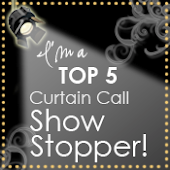 I am soooo behind in acknowledging awards given to me by fellow bloggers. So sorry it has taken me so long ... I certainly don't want to seem unappreciative ... because I really really do appreciate the awards and tags! I try to keep track, but if I've missed you just kindly let me know. Thank you, girls! 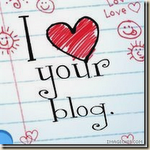 I love your blogs too!!!! Look at these amazing RAKS I received last week! The first is from my SU sideline, Lorri Heiling. Lorri's card is thanking me for the birthday gift I gave her, and it uses the new Level Two Hostess Set, Occasions Collection. It's difficult to see in the photo due to the glare, but the gift image is inside the Build-A-Brad! Clever! This next card is from Jessica Rone. 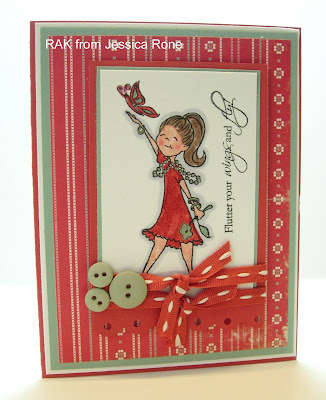 Jessica's card uses a Paper Pretties image ... her coloring of the image is pure perfection! I wish you could see the sparkle too! I love the cluster of buttons!